If you are unfamiliar with the concept of sight words, they are words that beginning readers learn to memorize to help them build reading confidence. In Tennessee, where I live, there are 40 kindergarten sight words that kindergarteners need to master. A sight word is a word whose spelling is not always straightforward and memorizing sight words helps beginning readers get past that reading hump. Here are some entertaining sight word practice ideas to get your little ones confident with the sight words so that they will foster a love of reading. My son and I played a fun sight word game the other night that I thought I would share with you. He wanted to play Tic-Tac-Toe which I find kind of boring so I substituted his sight words and it was more fun for both of us. I hope you enjoy these kindergarten sight word learning ideas! 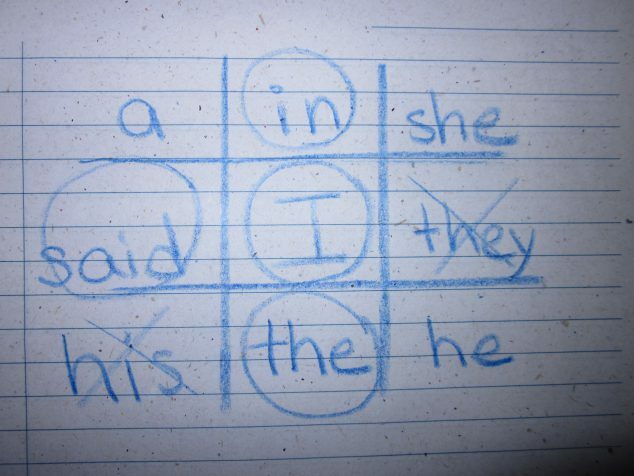 I drew the Tic-Tac-Toe board and filled it in with random sight words. Then I got to pick the square and he had to read the word. If he got the word correct, we put a big “O” around it and if he got the word wrong, we put a big “X” over it. He had to get three “O”s in a row to win and I guess I could have won if I had managed to get three “X”s in a row but I never did. Trust me, you won’t mind losing when you are so proud of your child’s reading! He wanted to play this over and over and each time you can use different sight words! Flyswatter Sight Word Game– Place cards that have the sight words written on them on the floor. Call out a word and have your child slap that word with the flyswatter. Kids love an excuse to swat! Hopscotch Sight Word Game– Draw a hopscotch layout outdoors in sidewalk chalk. Then have your child fill it in with sight words and say them as he or she hops through the hopscotch! Silly Story Sight Word Game– Take turns creating silly sentences that include sight words and telling a story at the same time. Good for laughs as well as using the words! Have you child write or read the sight words you both use in each sentence. What are some of your favorite sight word practice ideas? Awesome ideas! We’ve been practicing our sight words with my kindergartener!